Sterling silver cufflinks with a bezel set coin pearl. Each coin pearl is 3/4" inch (15mm). Handmade in the USA. Sterling Silver cufflinks with a 5mm square top faceted stone and prong set genuine antique Chinese coin. Each cufflink is 1" inch (25mm). Handmade in the USA. Ancient genuine Trilobite fossils (over 300 million years old and found in Utah) are bezel set in sterling silver. Sterling Silver cufflinks with genuine 65 million year old ammonite fossils from Madagascar. Each ammonite is about 3/4" inch (20mm). Sterling silver cufflinks with a natural stone soft rectangle cabochon. Shown in Green Moss Agate. Available in an assortment of stone options. Each cufflink is 5/8" inch diameter (16x14 mm). Handmade in the USA. Sterling Silver cufflinks with top faceted rutilated quartz or black onyx. Each cufflink is 3/4" inch (18x13mm). Handmade in the USA. 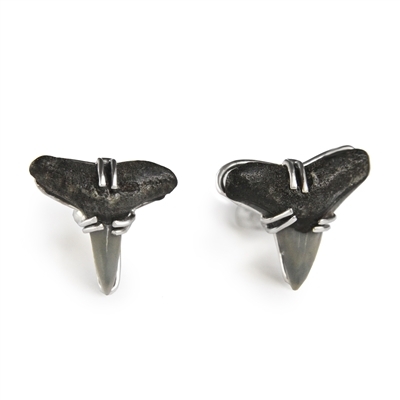 Sterling silver cufflinks with genuine fossilized shark teeth from the Cretaceous. Each cufflink is about 3/4" inch. Handmade in the USA. Sterling silver cufflinks with a large rectangle stone cabochon. Shown in Turquoise. Also available in Montana Agate, Petrified Wood or Dinosaur Bone. Each stone is 3/4" inch (18x13mm). Handmade in the USA. Sterling silver cufflinks with genuine Campo del Cielo meteorites. Sizes vary but are about 3/4" (20x15mm). Sterling silver cufflinks with rose cut (top faceted) labradorite. Larger top stone is 5/8" inch (14mm). Handmade in the USA. Sterling silver cufflinks with natural coin pearls. Larger top pearl is 5/8" inch (14mm). Handmade in the USA. 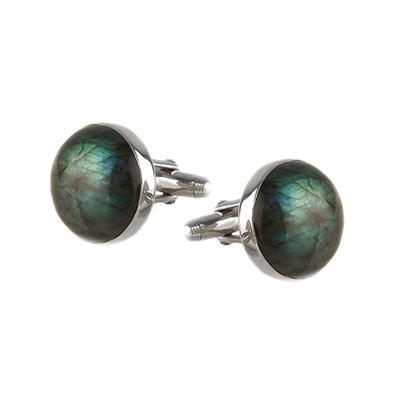 Sterling silver cufflinks with a large bezel set labradorite.